Enables you to download or email files. 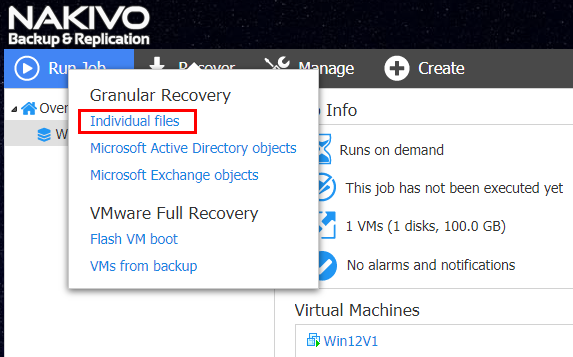 Let’s take a look at file recovery from a VM backup and how this can be done quickly and easily using NAKIVO Backup & Replication. Using the very intuitive NAKIVO Backup & Replication Web interface, choose Recover >> Individual files to start the File Recovery Wizard for granular file restoration. Next, choose the backup you need from the list of available backups. This has to be the backup of the virtual machine that contains at least one backup job run to create the recovery point. Additionally, select the recovery point. If you have more than one point in time available to choose from, select the point that you want to pull the file from. Especially with file recovery, this is extremely important. If an end user deleted a file from the server and a backup job ran after this deletion, you need to be able to go back to a recovery point created before the file was deleted. Once you select the recovery point and move forward, the recovery point is being prepared for the file recovery. The NAKIVO Backup & Replication interface allows you to browse the hard drives/partitions. Also notice that you have the ability to search the files in the mounted recovery point. This is a powerful feature to be able to recover a specific file, especially if you are not sure where the file is located. Often, if end users accidentally delete a file, they know which file they were working with, but are not sure about the path. The search feature can be extremely helpful in the case of end user files. 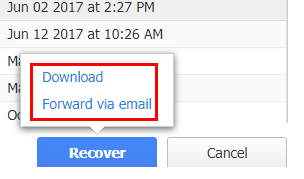 Once you select the Recover button, you have 2 options: Download and Forward via email. If you choose to Download the file, you will have a .zip file created and downloaded. This file will contain the files selected in the File Recovery Wizard. If you choose to Forward via email, you are presented with an email dialog allowing you to enter recipients of the files being recovered. Notice, you have the Attachments containing the files you selected in the File Recovery Wizard. Simply hit Send to email the recovered files. Restoring files from VM backups is an essential part of backup and recovery tasks that administrators need to perform regularly. NAKIVO Backup & Replication makes this process painless with the quick and easy UI-based File Recovery Wizard that allows you to point-and-click, browse a file in question, and restore this file. Additionally, you can search for the file that you want to restore using the Search feature in the File Recovery Wizard. This is a powerful way to determine the location of the file in question. NAKIVO Backup & Replication allows you to download the file(s) to be recovered or forward these files to a destination email address. Via these means, we can have near immediate access to restored files via both LAN and WAN regardless of the location. All of the file restores benefit from the deduplicated and compressed VM backups from the repository and need no agents.